Compact and rugged, the AudioBox 44VSL offers two convenient front-panel mic/instrument combo inputs and two mic/instrument combo inputs, global phantom power, and a total of six line-level outputs. It sports the same high-headroom, Class A XMAX preamps as the StudioLive mixers and has 24-bit, 96 kHz converters with 114 dB dynamic range for clear, clean audio. 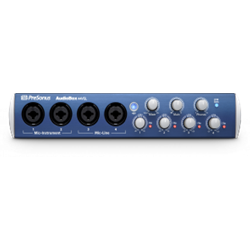 PreSonus gear has a well-earned reputation for extreme roadworthiness, and the AudioBox 44VSL is no exception. It employs a heavy-duty steel case that is every bit as rugged as that of the smaller AudioBox 22VSL and original AudioBox USB. VSL enables you to easily manage the processing and mixing from your Mac® or Windows® PC and provides editor/librarian functions, making it simple to create and use a library of presets. To get you started, we’ve included the same library of more than 50 Fat Channel presets that comes with StudioLive mixers. These presets were created by professional musicians and engineers and let you instantly set up dynamics processing and EQ for vocals, guitar, and much more. Seamlessly integrated with the included Studio One® Artist DAW and VSL, the AudioBox 44VSL interface works with virtually all Mac and Windows audio-recording software. And unlike most things nowadays, it’s very easy on your budget. So get the next-generation USB 2.0 interface that gives you real-time, low-latency effects; both mic/line and mic/instrument inputs; rock-solid construction; software mixing; and high-end audio for low-end prices: AudioBox 44VSL!